It's less than a week away ~ GULP! 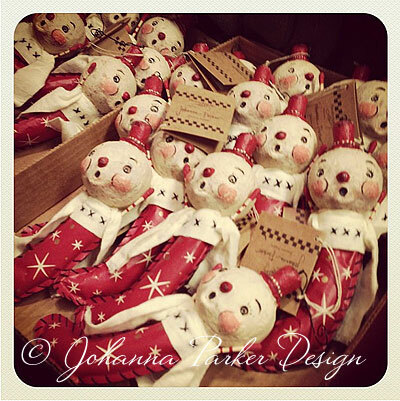 I'm referring to our 10th Annual Holiday Folk Art Show & Open House. 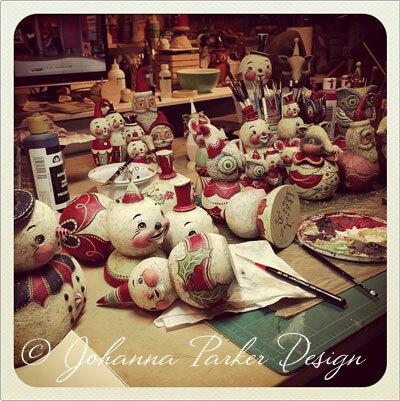 My workshop looks like a crew of elves had their way with my holiday creations, yet you and I both know that I don't have any elves! So, I can only blame myself for being such a mess-maker! It's countdown week for me, so I am only peeking in to say hello and to somewhat satisfy the curiosities of collector friends, wondering what goodies I am creating for this event. With little time to spare, I quickly snapped some images on my iPhone via Instagram. So, please excuse my quick, blurry pics. I typically shoot with my Nikon camera, playing with my lenses and such, but I honestly have no time for that right now. I am still finishing the painted details on a few one of a kinds, and with any luck, I hope to have everything complete by Monday's end so I can focus on transforming the house into a holiday shop! 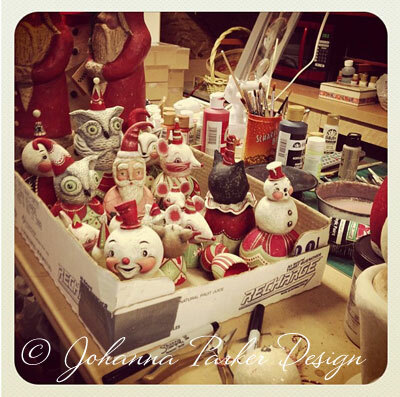 From one of a kind bell ornament characters, to kettle cups, sitters, candy containers, egg cups, ball guys and busts, it looks like I will have 30+ originals to offer! Of course, the rest of our house will be filled with a fun variety of my licensed reproduction designs. So, I hope you will join us. For details and the official newsletter invitation, please join my Mailing List. * The process of painting a collection of originals is a long series of many many steps and design decisions that sometimes make my head spin... I'm getting closer to finishing these guys, and I look forward to seeing the delight in the eyes of those who will adopt them! * My new snowmen ornament rattles, from Bethany Lowe Designs have all been signed and will soon suspend from feather trees in our front room. 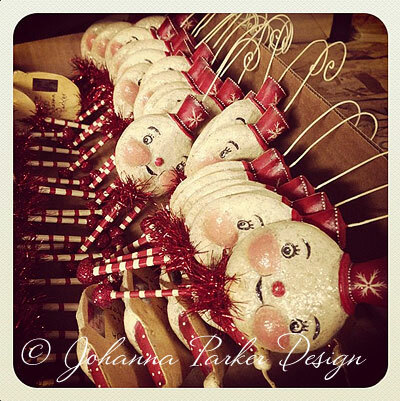 I was able to pre-order a special batch of these cuties, despite their official Christmas 2013 release date! 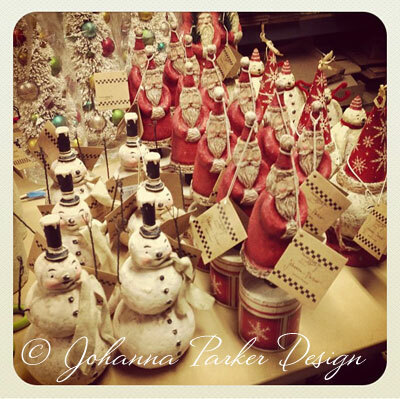 * My snowmen and Santas from Primitives by Katby line up for signatures, pricing and placement... The whimsical, vintage style bottle brush trees will also be available for shoppers! 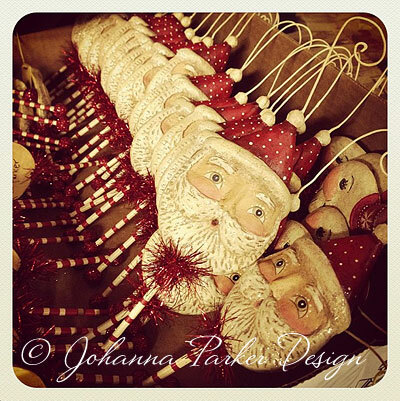 * To pair with the snowmen rattles above, these Santa ornament rattles are also debuting a year early, and only for the attendees joining us next weekend!